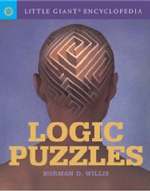 Norman Willis is the author or co-author of a large number of books on logic puzzles. His most recent books are The World's Biggest Book Of Brainteasers & Logic Puzzles (2006) and Little Giant Encyclopedia: Logic Puzzles (2008). 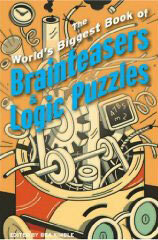 The puzzles come in many forms - math logic problems for the numerically inclined; lateral thinking conundrums; critical thinking bafflers; and mind-boggling word puzzles. All of them are designed to expand the reader's deductive reasoning and problem solving skills. 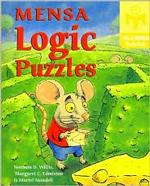 The answers to the puzzles are based on the information provided in each book and do not depend on previous knowledge, memory, or deception - just logical reasoning. Below are two examples from Willis' books for those eager to test themselves. To get to the right answers scroll to the bottom of this page. 1) "The 22nd and 24th presidents of the United States had the same mother and the same father, but were not brothers. How could this be so?" 2) "A supermarket theft has occurred. Someone took a fully loaded cart without paying for the groceries. One of the three suspects is guilty—but which one? The guilty party’s statement is true; the other two are false. Who is guilty?" Answer 1): That's because it's one man - Grover Cleveland - who was reelected after skipping a term. Answer 2): C is the guilty party.